What can be better than relaxing in front of a warm fire, enjoying its dancing flames? Perhaps you'll agree that being able to adjust that fire without having to get out of your chair is just the thing. 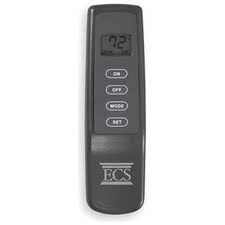 Designed to work with Empire remote-ready appliances, this battery operated remote is ready to operate your fireplace, stove, or insert without you taking a step. The remote has the ability to turn appliances on and off, as well as adjust the thermostat. WIll this work with Empire model: DVP30CC30BP-2 ? Yes, this fireplace is compatible with your model. Will this work with an Empire model VFSV-3004? This would indeed be an appropriate remote for your burner. To what extent is the thermostat controlled with this remote? The thermostat allows you to set a temperature and have the unit come on and off based on that temperature. The temperatures available range from 45 degrees to 99 degrees. Is this the replacement remote needed for an Empire VFSR-24C-1? The remote you referenced is listed as a compatible remote in the manual for the VFSR-24C-1. Is this remote control compatible with your Item #CUI-VFDR18LBP, 18" ventless propane gas log set? Yes, that is the correct remote. I have an Empire Heritage Direct Vent Stove, model DVP30CA30MP-2. Is this the proper model to control my temperature remotely with a thermostat? Does the unit include everything to complete installation, eg. receiver, etc.? Is professional installation required (seems to be the case...)? Thank you. This is indeed the correct thermostatic remote for your unit. It will include the remote and receiver required for installation and I would suggest having a professional wire the remote to your gas valve. Is this compatible with an empire CIBV-30-2 ? This remote may indeed be used with the CIBV-30. Will this Empire battery-operate remote with thermostat control work with my White Mountain Hearth Empire Comfort Systems vFP32FP30 fireplace? This will most certainly work with your Empire Vail 32" fireplace. Does the switch on the stove itself have to be in the remote position for the remote controlled thermostat to work properly? It does indeed. By switching the unit to this position, the unit will look to the remote receiver to complete the circuit and activate the stove. Can this remote adjust the flame output of the fireplace? No, this remote features on/off and thermostat controls that will simply turn the burner on or off based on your command or the pre-set temperature. A fireplace or gas log set needs a modulating valve in order to have flame-height adjustment functionality, whereas this remote is for a standard millivolt valve with no such feature. What is the effective range (in feet) is for good operation? Effective range for the remote to accurate send and receive is 25 feet. Any further distance can result in intermittent operation. Handy little indulgence for our new fireplace! No muss and no fuss! It doesn't get any easier than this! Push a button and there's fire, push a button and it's off. We haven't used the thermostatic function as yet but so far it works well in the On/Off mode. ProsNo fooling around with lighting the fireplace, just push a button on the remote. Easy for my wife to use. ConsIt seems a bit pricey for the convenience but if it holds up, it's probably worth it. Keeps me warm and does not over heat me! Easy on and off and thermostat control. Works great. This was easy to install (under 5 minutes) and works exacty like it should. We needed a thermostat for the freestanding gas fireplace in our office to control the temp. This works awesome!